Often, those who enter the 1980 Herb Brooks Arena in Lake Placid, NY envision a packed house, chants and cheers of "USA!" on repeat, waving flags and the palpable excitement of the 1980 Winter Olympics "Miracle on Ice" hockey game. For the next 37 years, athletes, coaches, referees, spectators and visitors looked up to see the scoreboard that registered the United States remarkable 4-3 victory over the invincible Soviet Union. It takes incredible moments to alter our perception of time, and despite an accurate count down on the game clock, the seconds seemed like minutes and minutes like hours to everyone in the building. For this reason, the scoreboard did more than just register numbers; it became a symbol of heart, triumph, and unity. On February 7, 2017, the famed scoreboard was lowered from the Olympic Center rafters, and now the latest and greatest of digital billboards hangs in its place. Even with a 40-year age difference, the old and new share a common birthplace, as both were constructed in Brookings, SD by the electronic display company, Daktronics. Founded in 1968 by two South Dakota State University professors, the business was less than 10 years old and had less than 100 employees when selected to build the scoring display systems for the 1980 Winter Olympics. Daktronics' location in the U.S., flexibility, and willingness to create whatever the Games required made the young company stand out to the Lake Placid Olympic Organizing Committee. Jim Morgan worked at Daktronics for 44 years, and currently serves as a board member after retiring three years ago from his post as President. 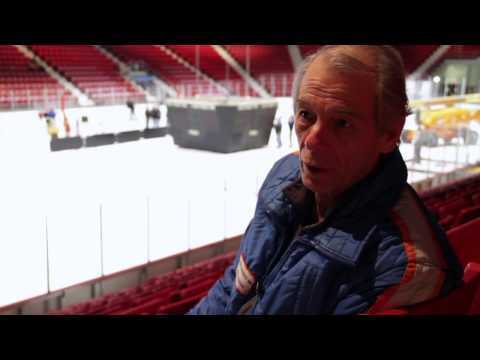 In the late 1970s, Morgan was Engineering Manager and worked as a project engineer for the Lake Placid Olympics. Morgan says that despite the magnitude of the Olympics, the company was confident in their technology. At the time, the hockey scoreboard was state-of-the-art with programmable team name captions over the scores and a high-end seven-segment bar digit design feature that eliminated the appearance of individual lamps. The manufacturing involved a three-part process: beginning in the metal shop, followed by the electronic shop and finishing with the on-site installation. System testing and interfacing began at the pre-Olympic trials in 1979, the year prior to the Games. They were prepared, but the small electrical engineering business from the Midwest never imagined their scoreboard would chronicle arguably the most iconic and symbolic sports upset to date. Morgan says that his involvement with the 1980 Winter Olympic Games in Lake Placid is the most memorable experience of his career, and the Olympics meant great things for Daktronics. Their role in the "Miracle on Ice" and the unexpected U.S. gold medal was a "big deal for the entire team" and a source of inspiration going forward. From a business standpoint, newfound credibility led to proposals for other large sports systems and providing scoring systems for a number of Olympic Games, including Calgary, Sydney, Salt Lake City, Atlanta, and Athens. Today, Daktronics employs over 2,500 people. Over the years, the company has returned to Lake Placid for maintenance and repairs on the 1980 scoreboard, and as the architect of the new board, they are excited about their continuing relationship with Lake Placid sports. The change is undeniably bittersweet, but from pee wees to pros, the original has served the Lake Placid Olympic Center well. Though the four panels are now divided between the Lake Placid Olympic Museum, Daktronics, the New York State Museum, and USA Hockey, they continue to represent hard work, determination, and passion for the game. Founded in 1968 by Drs. Aelred Kurtenbach and Duane Sander, professors of electrical engineering at South Dakota State University in Brookings, SD, Daktronics grew from humble beginnings, originally operating out of a garage. Their first project was to design and manufacture an electronic voting systems for state legislatures. Today they are a world leader in designing and manufacturing electronic scoreboards, programmable display systems, and large screen video displays. The company is passionate about what they do, takes pride in every product they build, and believe their innovation lies in forward thinking abilities.